Now, married with two children and the Wall a distant memory, Maxim decides to find the answers to the questions he couldn't ask. Why did his parents, once passionately in love, grow apart? Why did his father become so angry, and his mother quit her career in journalism? And why did his grandfather Gerhard, the Socialist war hero, turn into a stranger? The story he unearths is, like his country's past, one of hopes, lies, cruelties, betrayals but also love. 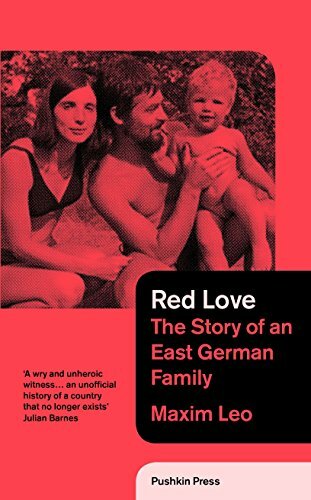 In Red Love he captures, with warmth and unflinching honesty, why so many dreamed the GDR would be a new world and why, in the end, it fell apart. Growing up in East Berlin, Maxim Leo knew not to ask questions. All he knew was that his rebellious parents, Wolf and Anne, with their dyed hair, leather jackets and insistence he call them by their first names, were a bit embarrassing. That there were some places you couldn't play; certain things you didn't say. Maxim Leo was born in 1970 in East Berlin. He studied Political Science at the Free University in Berlin and at the Institut d'Etudes Politiques de Paris. Since 1997 he is Editor of the Berliner Zeitung. In 2002 he was nominated for the Egon-Erwin-Kisch Prize, and in the same year won the German-French Journalism Prize. He won the Theodor Wolff Prize in 2006. He lives in Berlin. The author lives in Berlin, Germany.